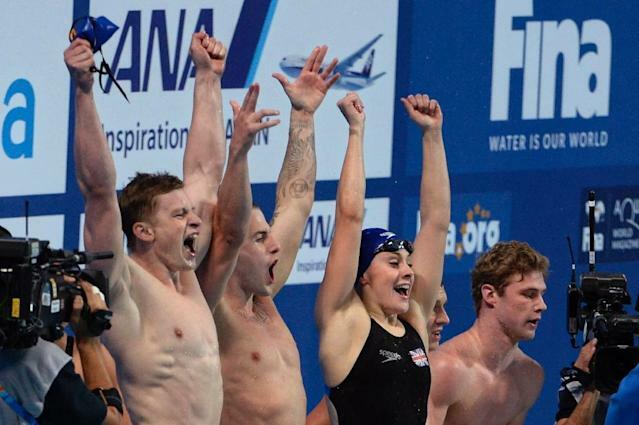 Kazan (Russia) (AFP) - Britain broke the mixed 4x100m medley relay record at the world swimming championships on their way to winning gold in the final -- the third time the record fell on Wednesday. The British quartet of Chris Walker-Hebborn, Adam Peaty, Siobhan Marie O'Connor and Fran Halsall clocked 3min, 41.71sec in the final as the United States took silver at 1.56sec back with Germany third at 2.42. Russia, then the US had previously both broken the event's record in the morning's heats and world records have now fallen on ten occasions in Kazan. Britain's Peaty, who swam the second leg to give his country a commanding lead, claimed his second gold of the night and his third in total having earlier won the men's 50m breaststroke final after setting the event's world record in Tuesday's semi-finals. "It's my first world championships, so I never thought I'd walk away with three gold medals, but I fought for every centimetre and every inch," said Peaty. "It's been brilliant so far and there's still the 200m to come, which isn't my strongest event." Having swum the anchor leg, Halsall said Britain's gold was poetic justice after their unofficial world record time of 3:44.02 to win the event at last August's European championships in Berlin was still waiting to be ratified. "We all stepped up and did a great swim, we can't ask for any more -- world record, gold medal and world champions, it's a nice feeling to start my week," said freestyle sprinter Halsall. "It's a great position to be with so many medals in the bag and it seems to be carrying the momentum on, it shows British swimming is going in the right direction." Britain won three gold medals on Wednesday alone in Kazan after Gary Hunt's victory earlier in the high-diving competition.